Active Ceramics Filter is the replacement filter for the Active Ceramics Large Whole House Filter System. 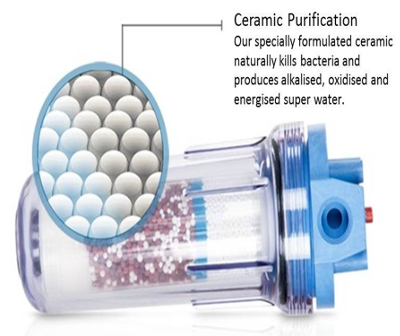 The filter is a high performance, long-life, compact whole house water filter, ideal for when space is limited. Removes 100’s of ingredients down to 1 micron including Unit will remove chlorine, toxins, heavy metals, hormones and fluoride. Effective at killing and containing bacteria in water such as E-coli, Pseudomonas etc. Provides softer, non-scaling water for kitchen and bathrooms. De-chlorinated water which is less aggressive on skin and hair in the shower – perfect for eczema and psoriasis sufferers. Very few filters are so effective in reduction of hormones and Fluoride. One of the most effective filtration systems at killing bacteria, and ensuring a bacteriostatic environment within the filter (NO bacteria, algae or funghi can grow within the filter).